While Dolma Kyab, a Tibetan writer and professor, has just been released after having spent ten-and-a-half years in prison, Lobsang Jamyant, a young monk aged 15, has been arbitrarily detained by the Chinese security forces as he was staging a solo peaceful protest in the main street of Ngaba. 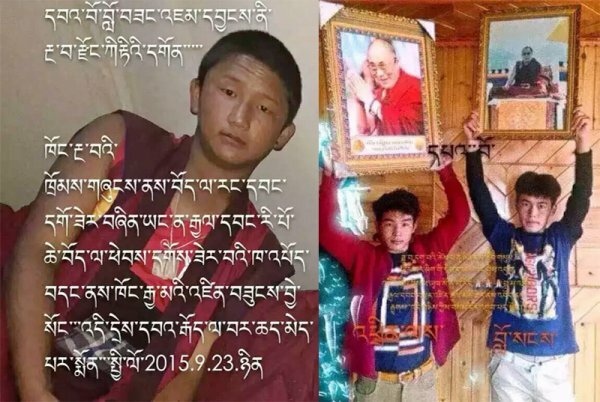 Dharamshala — Chinese authorities in Ngaba County, north-eastern Tibet have detained a 15-yr-old Tibetan monk for staging peaceful protest and shouting slogans calling for Tibetan freedom and the return to Tibet of His Holiness the Dalai Lama. Fear is growing in Ngaba Count of Tibet as many Tibetans, including monks are arrested and disappeared in recent months. Source also has confirmed that names of two Tibetans who disappeared in last month following their arrest by the Chinese security forces. "Lobsang Jamyang, 15, took to the main street of Ngaba town while shouting slogans calling for "freedom in Tibet and the return of His Holiness the Dalai Lama," Ven Kanyag Tsering, a monk with close contacts in the Tibetan region, told the Tibet Post International (TPI). Jamyang was arbitrarily detained by Chinese police forces around 4 pm local time, September 13, 2015 as he walked from main road in Ngaba County, now referred to as the 'Martyr's Street,' while he was staging a solo peaceful protest against Chinese rule," Ven Tsering said, citing contacts in the region. "Jamyang was detained within minutes of his protest and taken to an unknown location. His current whereabouts and condition remain unknown," he added, speaking on condition of anonymity. Jamyang, a Buddhist monk from Kirti Monastery located in Ngaba County, Amdo, (Ch: Aba County, Tibetan and Qiang Autonomous Prefecture in the north-west of Sichuan Province) one of the three traditional provinces of Tibet. "Jamyang, a native of village no. 2 of Meruma town, Ngaba County in Amdo, north-eastern Tibet. His father's name is Choephel and his mother is Tsomo. He became a monk at a young age at the Monastery where he studied the elementary monastic texts on Buddhist Philosophy. Sources said "two young lay Tibetans, Trinley and Lobsang, age unknown—also marched in the street, shouting slogans, on September 10, before being taken into custody by Chinese police." According to the same TPI source, Trinley and Lobsang, together had staged peaceful protest against the Chinese repression by shouting slogans calling for "freedom in Tibet" and "long life of His Holiness the Dalai Lama". TPI earlier reported on the arrest of the two young Tibetan protesters but the TPI source was unable to confirm their details, including their names. "Family members and friends have not been told about their arrests even as the well-being and whereabouts of the two Tibetans still remain unknown," TPI sources said, citing contacts in the region. Both Trinley (Tsur-ritsang family) and Lobsang (Tsitoetsang family) hailed from Soruma village of Choejema (Ch: Qiujima) Township in Ngaba County. But there is no information about the age and other details of the two at the moment. "Local Tibetans are under heavy surveillance by the increasing number of Chinese police forces, with security checkpoints and Chinese work team officials monitoring their movements and activities," sources said. The situation in Ngaba County has deteriorated with a large deployment of security forces in the recent months. Since September 10, all Internet lines in the Ngaba county and surrounding areas remain blocked except for government offices and institutions. The list of Tibetans arrested and detained by the Chinese police and security forces for staging solo protests in favour of freedom in Tibet and the return of His Holiness the Dalai Lama, is consistently growing in recent months. This tendency clearly contradicts China's recently released white paper, which claims that Tibet has reached its 'golden age'.